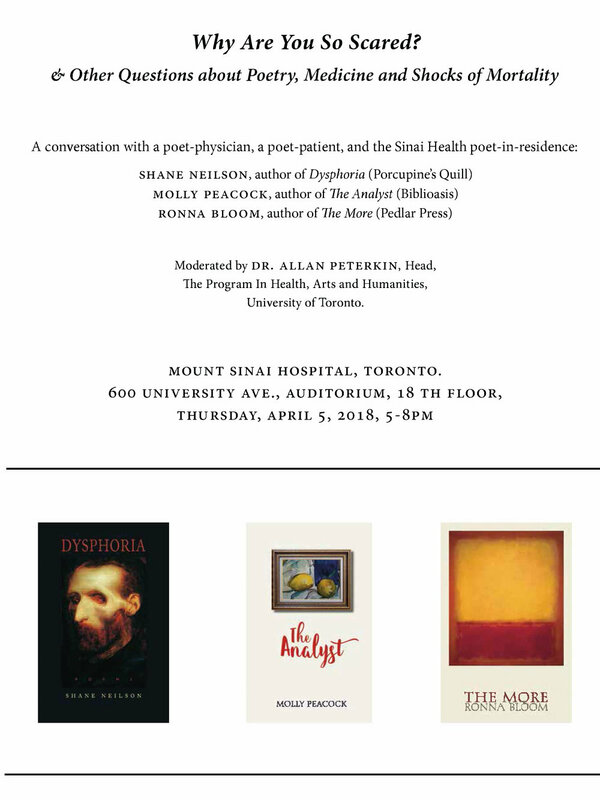 A conversation with a poet-physician, a poet-patient, and the Mount Sinai poet-in-residence. With Dr. Shane Neilson, author of Dysphoria (PQL); Molly Peacock, author of The Analyst (Biblioasis); and Ronna Bloom, author of The More (Pedlar Press). This symposium and exhibition bring together an international group of artists, conservationists, poets, writers, and historians, who will explore the often surprising intersections between these two endangered objects of mass luxury consumption. 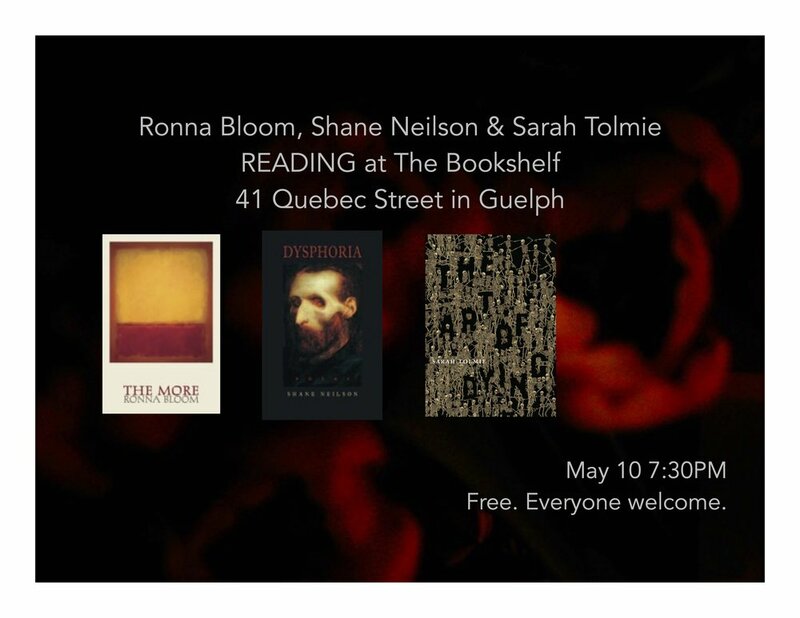 Hi friends, I'll be reading with Sarah Tolmie and Shane Neilson at the wonderful Bookshelf book store in Guelph Ontario. Join editors Fiona Tinwei Lam and Jane Silcott as they launch their new anthology "Love Me True: Writers Reflect on the Ins, Outs, Ups and Downs of Marriage" alongside a long list of Toronto-local contributors! Come to Ben McNally at 366 Bay Street and enjoy yourself in the company of sometimes funny, sometimes harrowing, and always engaging poetry and nonfiction prose. Readers for this event include: Ayelet Tsabari, Eufemia Fantetti, Maureen Hynes, Ronna Bloom, Samra Zafar, Maureen Scott Harris, Lauren McKeon, Lorri Nielsen Glenn, Donna Besel, Susan Olding, Gina Leola Woolsey as well as Fiona Tinwei Lam and Jane Silcott. Free admission. Books available for sale & signing. Bring friends! I’ll be reading from my new book, The More, at at the long-running Tree Reading Series in Ottawa. Can't wait to be back in Ottawa. Post-skating, pre-tulip season. This event has been cancelled due to an emergency in the family of one of the participants. We hope to reschedule when we can be together with poetry. We are grateful to The League of Canadian Poets and The Canada Council for Arts for their support of this program. I will be reading from The More in St. John's joining fellow Pedlar Press poet Jack Davis with his new book Fauna. Join artist Yaara Eshet and myself for a reading and conversation about the process and the work in Hello, Other Moon.